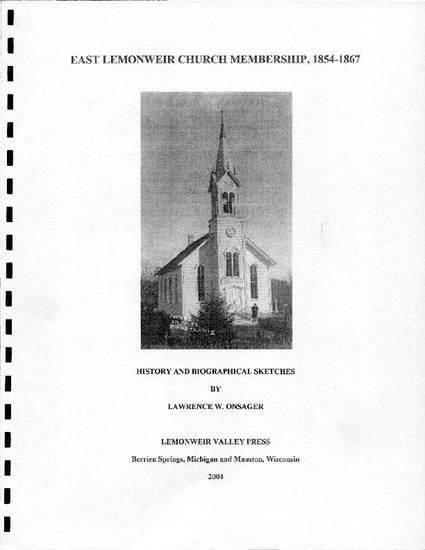 This church record accompanied by a brief biographical sketch for each member covers the first 13 years of the memberships, baptisms, marriages and deaths during the pioneer period in the history of the Norwegian Evangelical Lutheran Congregation in Lemonweir. In 1850, Norwegians began to settle in the Lemonweir (present town of Lindina) in Adams (present Juneau) County, Wisconsin. That fall, Ole Gjermundson Tveit, a bachelor and the families of Nils Bjornsen Farastad, Ole Johnson Magnushommen, Knud Ormson Mo, and Knud Mikkelsen claimed land in sections 4-9 in the present Town of Lindina. On July 25, 1854, in response to this written call, Reverend Herman Amberg Preus organized "The Norwegian Evangelical Lutheran Congregation in Lemonweir." In 1856, the congregation united with the congregation in Roche a Cree across the Wisconsin River in calling a pastor from Norway. But this took time. Preus conducted thirty four church services during the eleven years that he served the Lemonweir parish. The congregation's first log church was undoubtedly built in the summer of 1861. On December 6, 1861, the congregation incorporated under the name of "The Norwegian Evangelical Lutheran Congregation near the Lemonweir River, Juneau County, Wisconsin." The first elected trustees were: Anders Arnesen Rosseland - for three years, Torstein Thorbjornsen - for two years, and John Halvorsen for one year. The Lemonweir church was dedicated by Pastor Preus on Tuesday, August 28, 1863. On August 30, 1864, Candidate of Theology, Styrk Sjursen Reque was called as pastor for the Lemonweir, Roche a Cree, and Moe (Newport) congregations. Because the congregation in Lemonweir had increased three fold, the pastor's residence was to be at Lemonweir. On October 14, 1865, the three congregations entered into an agreement to purchase 80 acres of land in section 30 of Lisbon Township as a parsonage for their pastor. The Lemonweir Church contributed $350 and the Roch a Cree and Moe congregations each contributed $200 toward the purchase. The Lemonweir congregation also paid $50 to repair the dwelling on the premises. The trustees who signed the agreement were Gabriel Odsen, Endre Einarsen, Helge Hegesen, and Isaac Emmunsen from the Lemonweir Church; Andrew O. Hahn and S. H. Hilleboe from the Roch a Cree Church; and Martin Nilsen from the Moe Church. The Norwegian settlers were predominantly from Suldal Parish in Rogaland County, Telemark County, and Laerdal Parish in Sogn og Fjordane County.